This post is brought to you by Le Creuset // Guys. For the last few weeks I have had the most beautiful Le Creuset Dutch oven just sitting in my kitchen. I had big plans for that baby but it slowly got pushed back behind more urgent projects, until today. 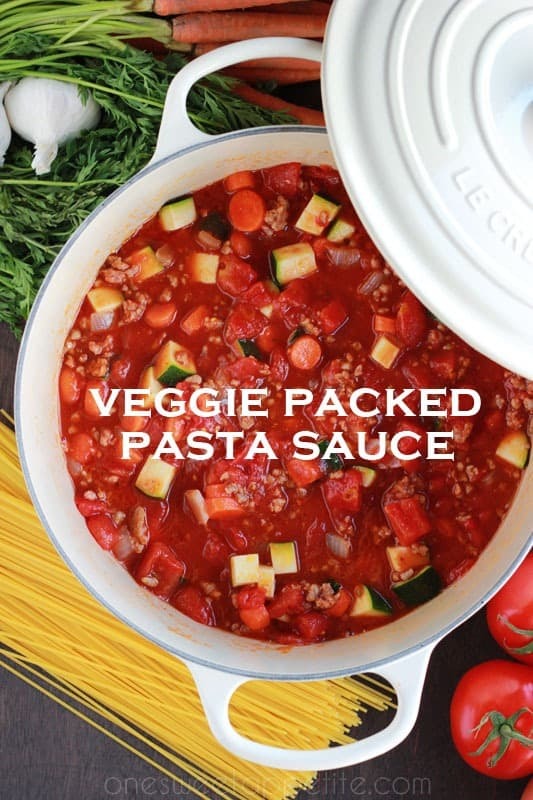 This veggie packed pasta sauce is my secret weapon when it comes to getting more vegetables into my families diet. Ok, so technically I don’t have to work too hard being sneaky since my five year old will basically eat anything under the sun, but I happen to have a picky palate. All of the flavors seem to just melt together. I’m sure it has something to do with simmering for over an hour. Smoother a hand full of spaghetti noodles in this delicious marinara, add some meatballs or baked chicken, and sprinkle with a little fresh Parmesan and you have yourself the perfect meal. Oh, and one thing I need to mention… IT’S FREEZER FRIENDLY! Make a double batch for an even easier weeknight meal. 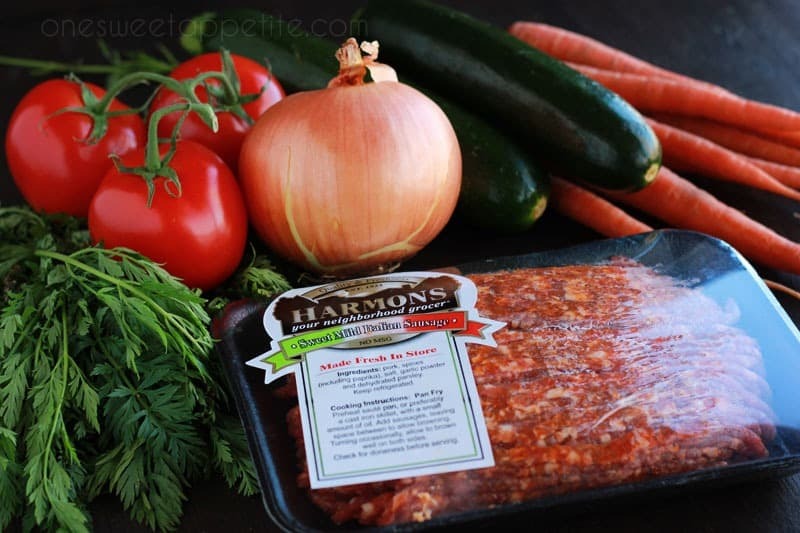 We love to use Italian sausage (sweet mild if the babe is going to be eating, and spicy if it’s just for me and my hubby) but really you can even use regular hamburger. Once you’ve chosen your meat it’s time to get things rolling. Heat a little olive oil in a LARGE pan or, in this case, a Le Creuset Dutch oven over medium heat. Toss in your preferred meat, some onions, and a little garlic. Brown away and watch in aw as you witness cooking magic happen in the bottom of your pan. I especially love the tan interior. It helped me keep an eye on the cooking process and made it easier to see when things were done cooking. The best part would have to be that NONE of the meat stuck to the bottom. Not one little bit. This is the exact moment that I fell in love. I was fully prepared for the need to add more olive oil or heavily push on the bottom with a spatula to keep things from sticking, but that time never came. It was a beautiful cooking experience that I cannot wait to experience again and again! Now comes the easy part (as if the first bit wasn’t easy enough). Toss in the diced tomatoes, veggies, and just a couple spices. Simmer, simmer, simmer. Voila! Just like that you’ve got delicious veggie packed sauce that is ready to cover your favorite pasta! Come back Saturday and snag my recipe for easy Garlic Knots and don’t forget to check out my quick step by step video! Heat your oil in a Le Creuset or large sauce pan. 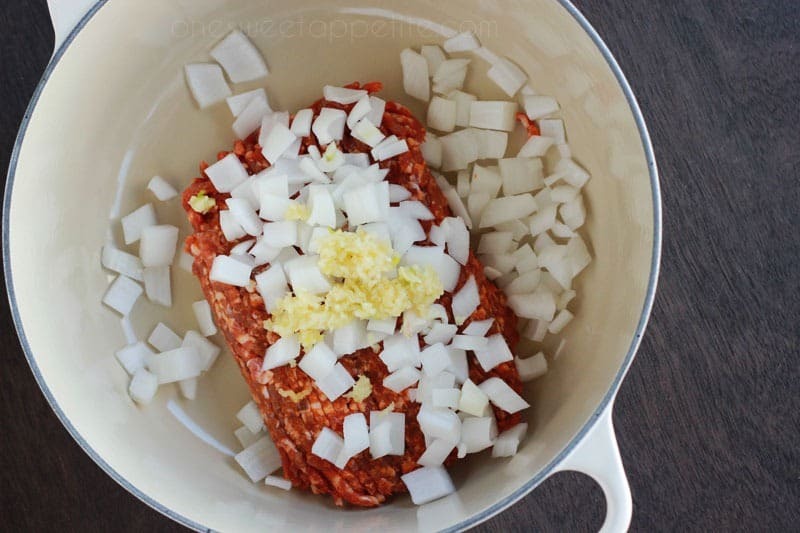 Add the sausage, onions, and garlic. Cook until browned. 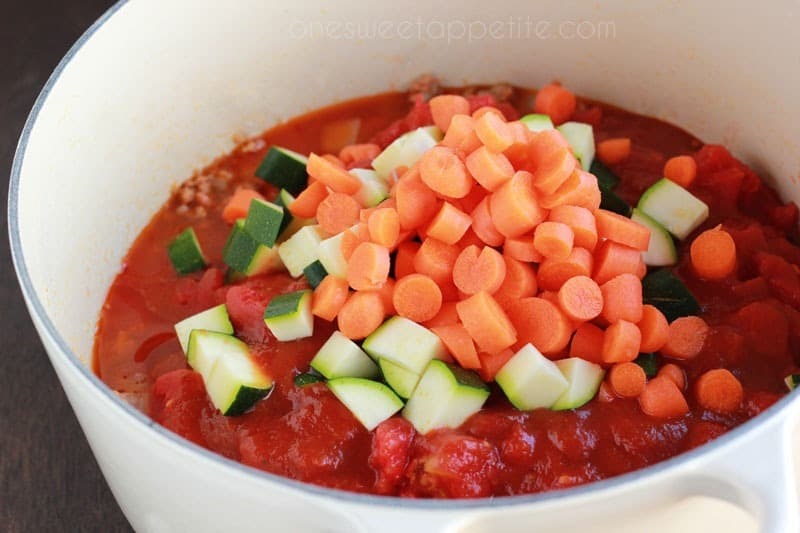 Stir in the diced tomatoes, tomato sauce, zucchini, carrots, sugar, baking soda, salt, and pepper. Bring the sauce to a simmer and cook on low heat for at least one hour or until the veggies are soft. I was provided with a Le Creuset Dutch oven in exchange for this review. Like always, all opinions are genuine and my own. It’s gorgeous!!!! And this recipe look TASTY!!!! Definitely going to give it a try! This looks and sounds so yummy! I love when I can sneak veggies into my kids’ favorite foods. I will definitely be making this soon. I LOVE LOVE LOVE this cookware, I’ve had my set for over 20 years and it still performs beautifully! Will never used anything else. The recipe sounds delicious, I’m going to try it! I LOVE Le Creuset! Every time I use mine I can’t believe I’m cooking in something so beautiful. And this pasta looks amazing! I always think pasta sauce is best when packed with veggies. I’m so going to make this soon! I’ve dreamed of the day when I’ll be able to have a Le Creuset pot or dish. And this sauce looks gorgeous! The perfect way to sneak veggies into your meal! This sauce looks like it is to die for! this looks delicious!! I have been a sucker for pasta lately so I will for sure be trying this! What a gorgeous Le Creuset! I adore mine and use it for just about everything, especially in the winter. Perfect for sauces like this one! 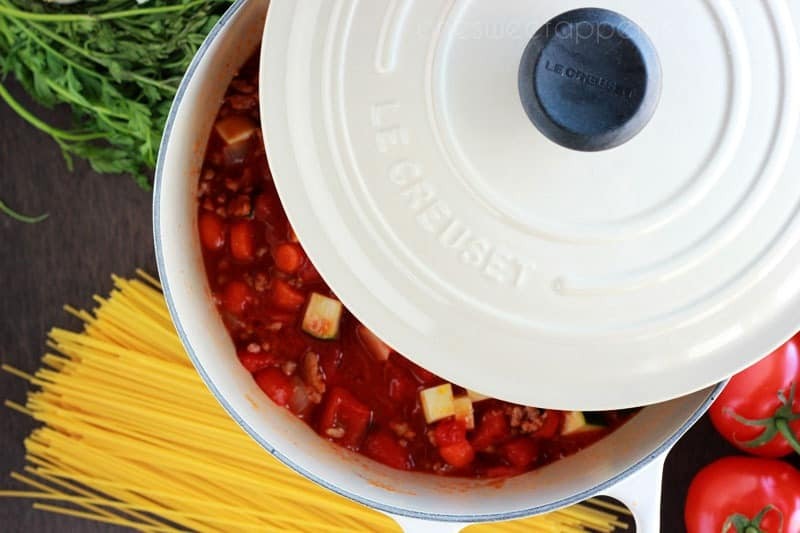 The Le Creuset Dutch Oven is on my list of “must haves” would love to own one. Will be trying the recipe very soon. Looks wonderful. This is just gorgeous, and I love all those healthy veggies jammed in there! 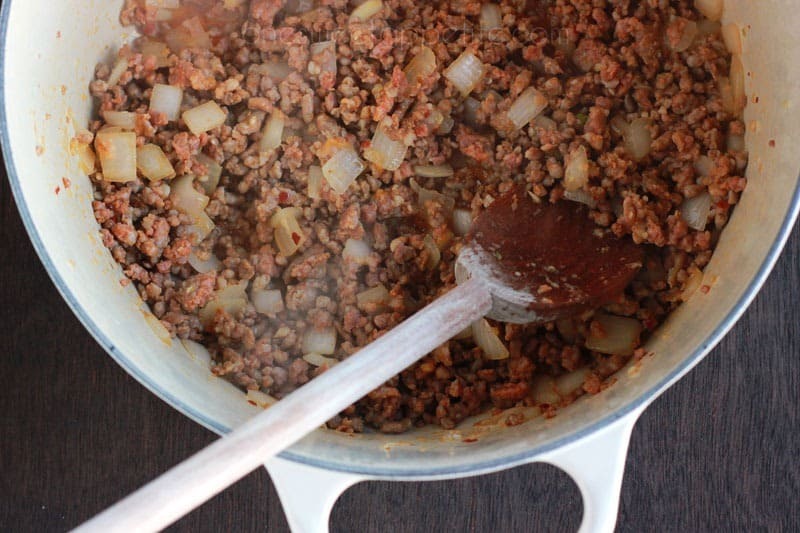 So yummy to use Italian sausage instead of ground beef, too – such an easy way to really amp up big flavor! Yum!!! This looks delicious! I’ve been wanting a dutch oven. I’ll have to keep this one in mind. That looks so good! I’ve had a Le Creuset pan on my wish list for awhile now. Heard so many good things about them! Now I’ve got to pull out my le creuset pot and make a batch of sauce! A great way to sneak some veggies in. Love the gorgeous Le Creuset pan. I’ve had my eye on the Caribbean blue one. This look so delicious! I love that it has so many vegetables in it! Can’t wait to try it out! Your Le Creuset pan is absolutely amazing and what you made in it even more so. The sauce is perfect for these cold, snowy days.